Take a look at our huge selection of Pop! Vinyl Figures, Action Figures, Statues, Construction Toys, Mini-Figures, and Key Chains! Loki''s head becomes the vessel out of which you drink! 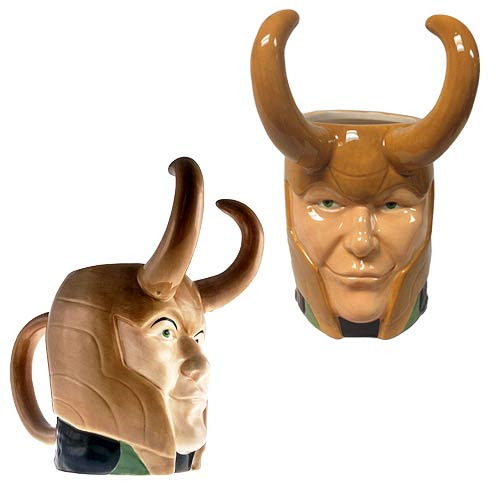 This Thor Loki Marvel Molded Mug features the god of mischief''s classic helmeted head as a cool ceramic mug. Hand wash only. Not dishwasher safe. Do not microwave. Holds up to 16 ounces of liquid. Ages 12 and up. "I love Entertainment Earth. They are super easy and I get my stuff in a timely manner!" "I love Entertainment Earth. They are super easy and I get my stuff in a timely..."